20140212 + Up in the am, dropped the little boys off at school on the way I work. L took D to the Dr for a check-up. I had a busy good day of meetings. 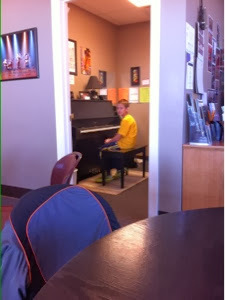 I got a text from L, she had J at his first piano lesson! I headed home and took a call the entire way. I got home and asked J what he learned to play. He said he didn't even touch the keys. He learned about notes. I thought they would teach him Three Blind Mice or something... BORING!!! Had dinner and then played some cards and had ice cream with the little boys, then got them to bed. Gma&paW called, they are freezing too. I ran to pick up D and drop off a video. Home to watch some of the Olympics.